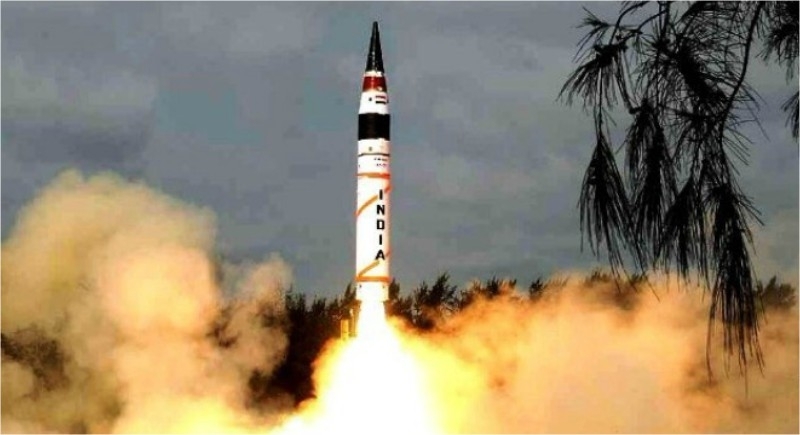 New Delhi, December 10: Showcasing the high end power incurred by India’s defence system, India on Monday successfully test fired its indigenously developed surface-to-surface nuclear-capable ballistic missile Agni-V from Dr Abdul Kalam Island off the Odisha coast. The Agni-V surface to surface missile having a strike range of 5,000 Km was launched from the Integrated Test Range (ITR) at Abdul Kalam Island in Bhadrak district. This was the seventh trial of the indigenously-developed surface-to-surface missile, which was successful. Agni-V is a three stage missile, 17 metres tall, two metres wide and capable of carrying 1.5 tonne of nuclear warheads. The missile was a user associated trial and strategic force command and was conducted by the DRDO scientist. The missile developed by the Strategic Forces Command and the Defence Research and Development Organisation (DRDO) is the most advanced in terms of navigation and guidance, warhead and engine. The missile is designed to hit the designated target point accurately, guided by the on-board computer with the support of a Ring Laser Gyro-based Inertial Navigation System, the Micro Inertial Navigation System, fully-digital control system and advanced compact avionics, as per the DRDO officials. The first test of Agni V was conducted on April 19, 2012, while the last test was conducted on June 3, 2018.